To create a locator map, go to datawrapper.de and click on "New Map" and the "Locator map". This will open the locator map creation pipeline. Four steps will lead you to your final map: 1: Add markers, 2: Design map, 3: Annotate and 4: Publish. In this article, we will focus on step 3 and 4. We recommend using the title to tell your readers what's interesting about this chart – the one key statement that you want to show on this map, e.g. "Earthquake hits close to main cities"
The description should have as much information about the markers and map as possible: What do we see exactly? E.g. "Earthquake at the 28th October 2016 in Indonesia"
Think of notes as footnotes, where we want to specify any abnormalities E.g. "Map shows only the five biggest impact points." Our locator maps are not interactive, so there won't be any tooltips in the final version. If you want to give further information about your markers, you can create a key for your markers. Title: You can give your marker key a title, but you don't need to. Often, a key is self-explanatory. Position: You can decide if your marker key should be above or below the actual map. 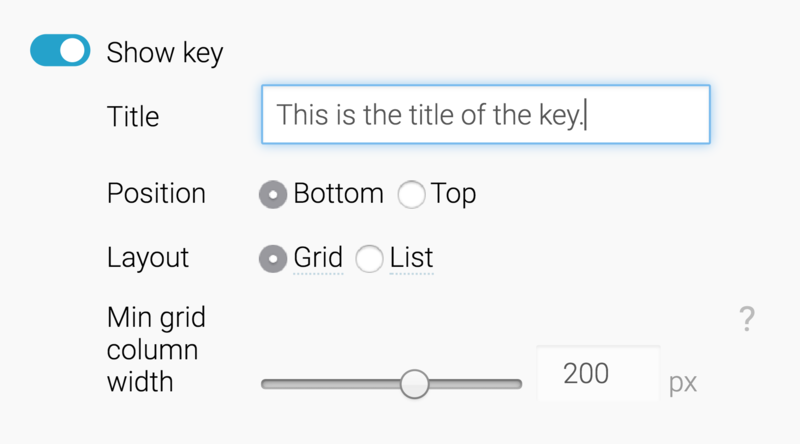 Layout: Here you can choose if your key should be displayed as a grid or as a list. Play around to see what works better. A grid layout usually works best for longer explanations, while the list layout works better for shorter explanations. Min grid column width: If you choose the grid layout, you can decide the width of the columns in the grid here. You essentially decide how many columns will fit next to each other. The wider your column, the less columns will fit side by side. 👉Make sure to check the appearance of your map key in the mobile version, too – it will look differently! You will see all the different symbols that you've created. If you created multiple markers with the same symbol, you will only see this symbol once in the list. Congratulations to your finished locator map! In this last step, you can publish your work and decide how to share it with the world. The best way to use a Datawrapper chart is by embedding it directly on your website. To do that, click the big blue button that says "Publish Chart". Then, copy & paste the embed code snippet into your website or CMS. You can also download your chart as a PNG or PDF by upgrading to a paid Single or Team account.